« Does news judgment still have value as journalism changes? This will be a long post about storytelling in journalism. It starts with a story I wrote in 2000 that was never published. This was from a trip I made to Venezuela as a reporter for the Des Moines Register. In this version, I identify the Venezuelans I interviewed only by their first names. I used their full names in the version I submitted for publication then, but I don’t feel comfortable using their names a decade-plus later (though some are identified in the published story linked below). Other editing of my original draft is minor. I’ll discuss some current issues relating to storytelling in journalism after I finally publish this story. Blanquita de Perez, Venezuela — Like the houses and buses and mountainsides, the language barrier stood no chance against La Tragedia. 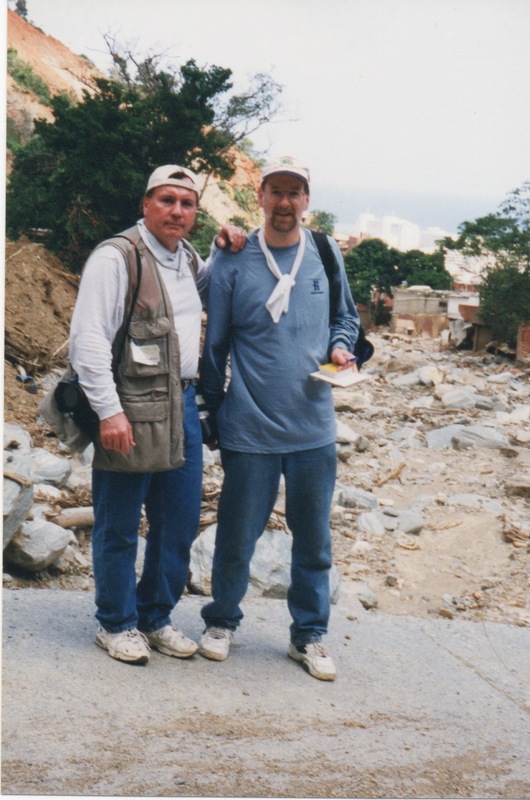 Even a journalist who needed a Spanish-English dictionary to look up his own trade (periodista) could understand the stories I heard as Ramon took photographer Gary Fandel and me walking through this village on the edge of the devastated seaside resort of La Guaira on a Thursday morning in February. No interpreter was available, but the wide swaths of mud and boulders we had seen on the bus ride along the coast beckoned. We needed a close look at this carnage, known here simply as La Tragedia, The Tragedy. With their hands and their faces, surviving villagers told stories any person could comprehend. For details, I flipped quickly through my dictionary, looking up key words and repeating them back to these amazingly patient people. “Si!” would indicate we were getting it. “No” sent me thumbing again in search of the right word. Ramon, who spoke no ingles, helped by repeating critical words, sometimes writing them out in my notebook or finding them for me in the dictionary. “Cadave,” he repeated slowly as Magaly was telling about La Tragedia. Her eyes showed profound sadness, lingering horror. With huge sweeping motions, her hands showed us she was talking about the torrent of mud and boulders that roared down the mountainside. Cadave. I quickly flipped through the dictionary, searching for the word as Magaly continued her tale, still following the downward path with her hands and her eyes. “Cadave?” I repeated, making the downward gesture with my own hand. “Si!” This woman had seen corpses sweep past in the river of mud. The RAGBRAI cap I gave Magaly seemed grossly inadequate, yet she smiled and put it on her head, then her daughter’s, and they both laughed. Breathtaking vistas of the Caribbean Sea loomed behind us, but you couldn’t look that way. The mud and boulders commanded our attention. And especially the faces. Maria had lived in her house 49 years. We came across her and her family and friends doing laundry on rocks and a board in a tiny stream trickling through the path of boulders and mud that had hardened like concrete. What was the name of this place, we asked. It wasn’t on any maps, they told us, because the government didn’t want them living there. They called the place Quebrada Seca. Dry Ravine. “Donde es su casa?” we asked Maria. Where is your house? She pointed to the side of the ravine. Hers had not been washed away or buried. A half dozen or so houses stood where she was pointing. Ground floors were filled with mud to the ceiling where ceilings remained. Roofs and walls of upper floors were smashed and washed away. The trunk of a large shade tree rested in the remains of one home’s upper floor. Censada, the government agency counting the dead and the living in Venezuela’s devastated areas, had painted Maria’s surname and some other names and numbers on the walls of each house, meaning government workers had identified the homes and accounted for the people who once lived there. Maria started explaining which of her relatives lived where, pointing to each of the houses. Her Spanish was too fast and mine too slow for me to catch who lived where, but I understood as she summarized with a sweeping gesture of her arm, pointing at the row of houses. Maria shows where her family used to live before the mudslide. She smiled and told me more about La Tragedia, but I could not understand. How could you understand? The path of mud, boulders and debris appeared to be 100 yards wide, perhaps more. I couldn’t step it off for a more accurate estimate. The boulders made it impossible to walk straight across. I climbed up on one with a fairly flat top and paced eight steps across. This boulder was about 25 feet long and, looking around from atop it, I could see hundreds nearly as big, thousands that were smaller but still could crush a car or a wall. A half dozen or so boulders made the second floor of one house sag by a foot or two. The floor, all that remained of the second story, would have collapsed, but the mud that filled the first floor supported it. Strewn among the mess were personal items too numerous to count: broken vinyl records, dolls, sneakers, baskets, baseball caps, video tapes, pillows, purses, phone bills, a saturated accordion file filled with once-important real estate and military documents. 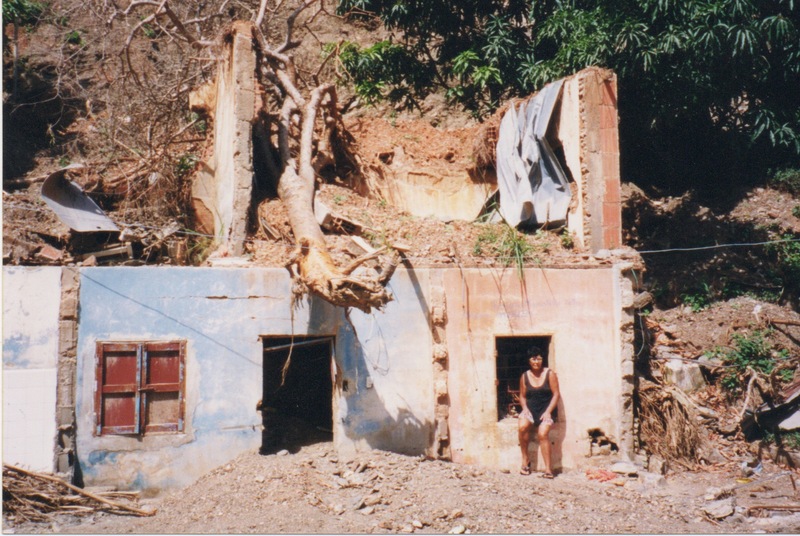 More than two months after La Tragedia, thousands of people remained missing, either buried under rocks, mud and rubble or washed out to sea. We later learned (and perhaps one of these women had told us) that a woman’s body had been found the day before in this very ravine. Above the gorge loomed El Avila, a mountain that stretches for miles along the coast. In early December, the slopes were green with banana and avocado trees and other thick vegetation. Now huge stretches of mountainside have turned into tan and gray cliffs with a touch of red, scars showing where the mud and boulders once had been. A short walk from Quebrada Seca, in the village of Blanquita de Perez, Ana still had her home, upstairs above the shop she and her husband Manuel operate. At the top of the stairs, we wiped our feet on a towel advertising Coca-Cola, then on a welcome mat that bade us bienvenidos. Ana graciously showed us into a tidy home with two small bedrooms, a living room and a small kitchen with a plaque honoring the pope, Juan Pablo II. Her son Wilde’s action figures were arranged more neatly than toys ever were in a bedroom of my own sons. Ana’s daughter Anayibeth, about 2 years old, had mosquito bites all over her legs. Gary sprayed her with insect repellent. Downstairs, family members with shovels dug dried mud away from the door of their garage. They happily accepted the loan of a wheelbarrow from the Iowa missionary team working on a church next door. Ana introduced us to her sister, whose family was helping with the cleanup. Pointing to herself, Ana said “mas bonita.” She was the prettier sister, she was saying, and we all laughed. 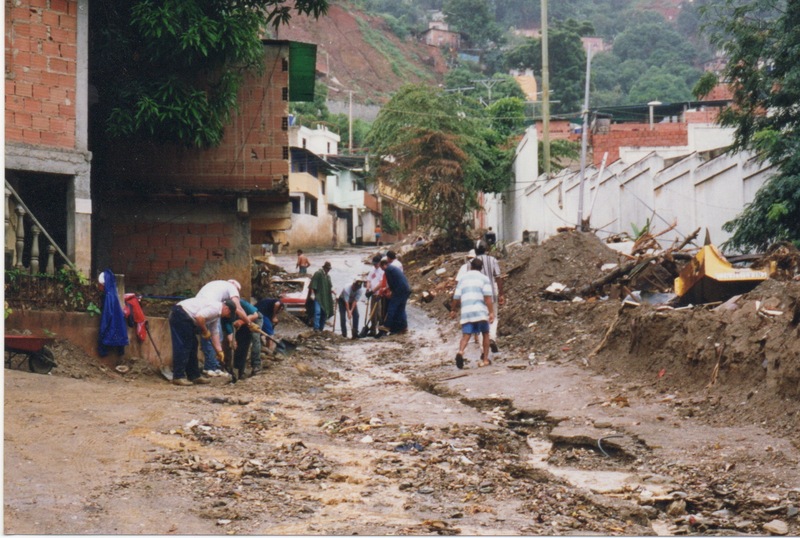 It took the family the two months since La Tragedia to haul out the dried mud from the shop, though the walls, floor and equipment still had a thin coat of brown residue. The shop was nearly empty, except for a table saw and another power tool I didn’t recognize. I wondered if they could possibly work after being caked in such mud. Ana showed us the garage, still filled with mud deeper than my waist. A Coca-Cola machine stood half-buried. A refrigerator had been tossed on the pile. A poster advertised Ruffles potato chips. When will Ana and Manuel be able to reopen their shop, we asked. Cinco meses. Five months. Through it all, Ana feels fortunate. “No estoy muerta,” she explained. I am not dead. We left Blanquita de Perez that day frustrated about the stories we had missed as these women told us about La Tragedia and overwhelmed by the stories we had understood. As I was packing my backpack for the next day’s return trip to Blanquita de Perez, I tossed in the unopened bottle of insect repellent I had packed, in case I would need a second bottle while I was in Venezuela. I watched for Ana Friday. Like the cap and the T-shirt, the bug spray was inadequate, but I wanted her to have it. I saw her running through the muddy street in her poncho and called out, then ran through the rain to her. She smiled and gave me a hug. This I understood. I thought of this story when I wrote recently about storytelling, prompted by the discussion that ensued when Jeff Jarvis suggested that the article had outlived its usefulness as the basic unit of journalism (he was not suggesting an end to articles, just an end to the article as default setting for journalism). Some of the reaction to Jeff’s post romanticized the long-form narrative as something marvelous that was being squeezed out of today’s journalism. But my recollection from decades working in multiple newsrooms is that great storytelling too often was a victory over newsroom default settings. I am proud of many stories that I wrote and edited and I’m thankful to editors who often made them better and fought for great display and ample space for strong storytelling. I mourn the loss to journalism and to our communities when great writers take buyouts or lose their jobs because their employers no longer value their skills. But I think it’s important to make the point that the prevalent thinking that Jay Rosen describes as the view from nowhere also was an impediment to good storytelling. I will not use the names of the editors in question here. One was an outstanding editor and remains a friend. And I don’t want to single out the other a decade later to settle an old score. They were reflecting common editing practices of the view from nowhere, and I see no point in criticizing them personally this long after the fact. I thought the first-person account above was the best piece I wrote from my week-long trip to Venezuela. I wrote it to accompany the overview story that ran as the first story in a four-part series (links to the full series are at the end of this post). I said it could run as a sidebar to the overview, but I thought it was the stronger story, so I suggested it as the lead piece for the series. My immediate editor told me he liked the piece, but didn’t think I needed to inject myself into the story. (It was a view from somewhere). So he edited it from first-person into third person. It was much flatter and less personal. I was still injected into the story, but as a third-person unnamed “journalist,” as if that’s not injecting myself into the story. The series was set to publish on Sunday, March 19. The afternoon of the 18th, I got a call from my immediate editor. Another editor had decided at the last minute that my watered-down third-person account should not be a separate story, but should be integrated with the main story. I was out of town and unable to reverse the decision by telephone. You can read the final result in the first link below: two chunks of this narrative are shoehorned awkwardly into a story about the mission trip. Just a few years later, we would have had an easy solution for this situation: We would have run the “view from nowhere” version in the print edition and I would have run the first-person account on my blog. I wrote a weekly column in 2000; I should have insisted at the time on making the first-person account a column (though it was too long), but I had agreed too readily with the change to third person, and I was too powerless to stop the shoehorning of a couple pieces of it into the main story. Doing a column afterward seemed pointless. My colleagues and I did a lot of great “view from nowhere” journalism over the decades of my career. I don’t regard this issue as a matter of one position being completely wrong and the other completely right. But I know that human judgment results in better journalism than arbitrary rules. This story needed to be told from the narrator’s point of view. I am hopeful that today’s upheaval in journalism will result in newsrooms where storytelling with a view from somewhere will be encouraged.